The new weekly analytical program “TROIKA REPORT” features a look at three of the most high-profile recent developments in international affairs. Two months after the Minsk peace accord signed on the 12th of February by the leaders of Russia, Ukraine, Germany and France in the Belarusian capital, the prospects for a long-lasting solution to the conflict in Eastern Ukraine still look vague against the background of a fragile truce repeatedly violated by both sides. Kiev has incorporated irregular units into its regular army and appointed Dmytro Yarosh, the head of far-right political and paramilitary group Pravyi Sektor (Right Sector), as an advisor to the Commander-in-Chief of the Ukrainian Armed Forces. At the same time, the self-proclaimed Lugansk People's Republic, one of two unrecognized entities in eastern Ukraine that sprang up in the course of the conflict in the region, has begun an operation to disarm and neutralize Cossack units acting on their own. The exchange of fire between the two sides in eastern Ukraine has intensified in recent days, clearly undermining the truce and setting the stage for a new round of hostilities. No wonder that the meeting of the foreign ministers of the Minsk agreement’s four signatories – referred to by Russian media as the Normandy Four after the location of their first meeting – produced controversial results in Berlin this week. Russia once again emphasized a holistic approach to the agreement that should be implemented not only in the military field but in the political, economic and humanitarian dimensions. Moscow underlined the urgent need to initiate the process of political settlement. Since any peacekeeping mission to a troubled region requires sine qua non the consent of both sides of the conflict, it made no sense to discuss the idea in the absence of the official representatives of Donetsk and Lugansk. Unsurprisingly, Germany and France abstained from comment and ignored Kiev’s move. The proposal to form four working groups was once again put on the table. The so-called Donetsk and Lugansk “republics” of eastern Ukraine have selected experts and are ready to delegate them into the groups designed to deal with crucial economic and political issues, as well as the plight of refugees and security matters. Kiev is expected to reciprocate. Despite meagre gains, the Berlin summit could be assessed as a positive sign, though the only tangible outcome was, probably, the admittance of the Ukrainian Foreign Minister Pavel Klimkin that the letter and spirit of the Minsk peace accord must be observed and that it has no alternative. Yet, the sad reality is that diplomacy of the Normandy format has its limitations. With the inertia of blood-soaked animosity and warmongering rhetoric, the civil war in Ukraine is far from being over. The road to a comprehensive peaceful settlement within a reformed Ukraine has a long way to go. The convergence of the Americas: a challenge to the Kremlin? U.S. President Barack Obama made new a bold move on the global chess board this week, inviting former arch-foes Cuba and Venezuela to a dialogue and patching up the United States’ quarrels with BRICS member Brazil at the seventh Summit of the Americas in Panama. Meanwhile, following a tête-à-tête of just 10 minutes between Mr. Obama and Venezuela President Nicolas Maduro, who had earlier lambasted the United States from the rostrum, his PA wrote on Twitter that the brief conversation was marked by “respect and cordiality” and that ”a lot of truth” surfaced. Finally, the United States’ most senior democrat persuaded Dilma Rousseff, President of Brazil, to pay a visit to Washington, which she had been reluctant to do in the wake of the scandal that erupted in 2013 after NSA documents leaked by whistleblower Edward Snowden revealed that the American secret services had eavesdropped on the Brazilian leader and stole industrial and technological secrets. “President Obama is making initial and still very reserved overtures towards Latin America. It is hardly likely to influence the policy of the aforementioned countries and have a negative impact on their attitude to Russia. Washington is only taking the first steps toward bringing inter-governmental relations with Cuba, for instance, to normalcy. Close cooperation is still not on the agenda. What do you make out of the decision of Brazilian President Dilma Rousseff to pay a visit to Washington? Is it a volte-face? …There is a good reason to reassess and abandon the knee-jerk reaction to any diplomatic or verbal incursion by the United States into any area that Russia deems to be either its traditional territory or zone of vital interests. TROIKA REPORT prefers to view the diplomatic offensive by Barack Obama to restore working relations with Cuba and Venezuela as an opportunity rather than a challenge. After all, talking to people with whom you disagree often makes you more susceptible to the logic of their thinking and behavior. What might be the expediency for Russia to begin a flirtation with Vietnam and Thailand? This is the underlying intrigue behind the recent visit to this part of the world by Russian Prime Minister Dmitry Medvedev. The trip by Russia’s Number Two almost coincided with the visit to Hanoi by Nancy Pelosi, the Democratic leader in the U.S. House of Representatives. It also took place at the same time as the tour of the “Eastern front” by U.S. Secretary of Defense Ashton Carter, who reminded the leaders of Japan and South Korea of the U.S. military's stabilizing influence in the region. The timing of the visits could be sheer coincidence but the messages of Moscow and Washington appear identical: When choosing allies and partners, you should weigh up the final gains carefully. After Hanoi and Washington patched up their old animosity in 1995, the two sides took a leap forward. 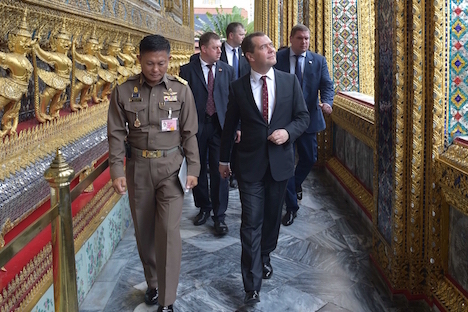 Would it be fair to assume that Medvedev’s visit to Vietnam and Thailand was an attempt to enlarge Russia’s footprint in the region and raise its profile? If so, what can Russia offer? “Indeed, it was quite a successful visit, which should be assessed within the context of Russia’s “pivot to Asia.” Compared to China and the U.S., Russia has a very special relationship with these nations. In one of his academic papers, Dmitry Mosyakov named Thailand the “unsinkable American aircraft carrier.” Does the visit of the Russian prime minister, in fact, the first visit on this level in almost 20 years, make any difference to Thailand’s status? Currently, Thailand is under serious pressure by the U.S., which is demanding that the military relinquish power and hold elections. The local “top brass” are reluctant to give up power for fear of a repetition of the recent unrest, in which the capital was first taken over by the “yellows” (those who supported the king and urban intellectuals), later to be replaced by the “reds,” (mostly peasants and supporters of the former prime minister, Taksin Chinavat). These upheavals weakened Thailand. The military took over, managed to ensure political stability and provided an impact on economic growth. If Thailand gives in to the pressure from the U.S., the consequences are unpredictable. As for Russia and America’s synchronized pivot to Asia, are these policies on a collision course? “They definitely are. The new American emphasis on Asia is breeding a lot of uncertainty, just as was the case with the repercussions of U.S. policy in the Middle East, which resulted in further instability in the region. Unlike the U.S., Russia is not pursuing a regime-changing agenda either in Vietnam or in Thailand. Russia, unlike the U.S., is supporting the status quo in South East Asia. That was the opinion of Dmitry Mosyakov. Moscow appears to be trying to make up for lost time in this undeclared rivalry – yet Russia has a competitive edge. After all, this year is only the 20th anniversary of diplomatic ties between the U.S. and Vietnam but the 65th anniversary of diplomatic relations between Moscow and Vietnam. The Soviet Union already boasted a strong relationship with Vietnam back in the times when the United States was fighting a 10-year war in the Asian country. This could be dismissed as irrelevant in our days when pragmatism, sometimes used as a euphemism for cynicism, rules supreme. Yet not everything can be calculated in hard currency. What matters as well is a relationship based on long-term stability, loyalty to customers, psychological compatibility, the legacy of past experience, and, believe it or not, emotional attachments – which still have a value in Asia.